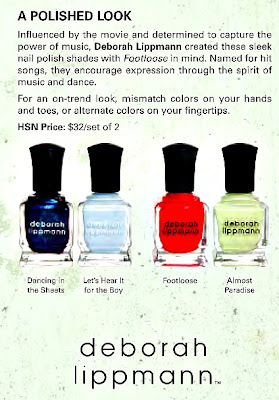 Last week I told you about a line of products (here) inspired by the new Footloose movie that are going to be featured on a Footloose Exclusive Show on HSN on October 12, and here's a look at the polishes from Deborah Lippmann. The products will be available on line beginning October 7. It's hard to decipher their finishes exactly, but the dark blue looks to be a shimmer, and it could possibly have some glitter shapes in there as well. I tried to enlarge it to see the detail better, but I can't really tell for sure. The other three shades appear to be cremes, and I love the Lippmann creme formula! Love "almost paradise" and "lets hear it for the boy". Other two are kinda generic. aww how cute. I love footloose! Very cute names. However I hate to see exclusive shades sold on the shopping channels. By the time you get the shipping and handling in - they are so expensive if you need to return making the return a real deal breaker - but then that's what the shopping channels count on of course! Somehow being a big fan of the original movie - things are not looking all that great in the sneek reviews of this re-make. How can you do the music better than the original songs by Kenny Loggins? Sadly I don't see anything all that new/unique in these shades - but we all know how graphic bottle shots can play tricks on us all! I would not buy them BEFORE I saw them swatches and they probably will be a sell out on air time. Thanks for posting these. I feel like we are the adult versions of all the movie marketing that has been tossed at kids for eons now! Can't tell a darn thing from that shot! Oh well, I'm sure I'll be seeing them soon. Thanks Mary for the heads up on these. I want them all just for the names. (The colurs are gorgeous too) One of the best soundtracks EVER! Just a heads up--I bought them today, and Dancing is supposed to be purple--even though the image they had looks dark blue. SO excited, great price for DL polishes!